What? You say that doesn't look like a winter adventure? 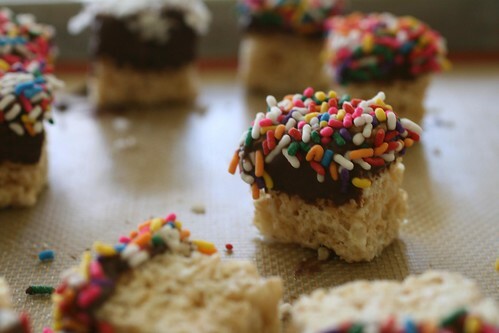 And I'll be honest, there is nothing adventurous about rice krispy treats dipped in chocolate and sprinkles, or even making them. But the adventure is what led me to even consider making them, inspired by what I saw in the dessert case at Foodlife. I realize I still sound like a bore. But foodlife was not a part of the plan at all. It was merely that my friends and I decided we wanted to go ice skating, so I suggested we make it even cooler since the weather was warm (yes, 40 degrees is warm) we go ice skating in Millenium Park. Two hours later, we were on our way there. And pleasantly surprised to see that it wasn't too crowded. And then there was a slight problem. An hour-and-a-half long problem that is. 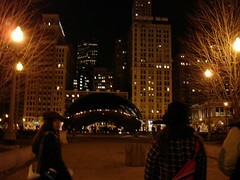 At 6:30 at night, ice skating is popular. There was a long line that we somehow failed to notice, attributing to onlookers or just ignoring. So ice skating was postponed. Neither my friend nor I were hungry enough for dessert, so when I got home, after making a nice fish dinner that, in order to be cooked perfectly, was eaten cold, made my version of the treats, sans sticks. I ran out of coconut, but it is my favorite of the toppings I used. Line or grease a 9x9 square pan. Melt butter in a heavy pan over medium heat. Stir in marshmallows, stirring until melted. Remove from heat and stir in cereal. Press into prepared pan and chill for 30 minutes. Cut into squares (6x6, or other size). Melt chocolate, either over simmering water on the stove, or in the microwave on medium in 30 second increments until melted. 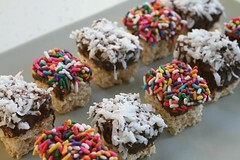 Dip squares into chocolate and then coconut. Set upright on a baking sheet lined with wax paper. Repeat for remaining squares.